B6 aims at developing and evaluating separation und switching strategies for Pickering emulsions (PE) in liquid/liquid (L/L) reactions. PEs will be optimized to yield high conversion in the reductive amination of aldehydes and at the same time high separation efficiency. Concepts developed in the 2nd funding period for the hydroformylation of dodecene will be adapted and expanded. Besides investigating the influence of operating conditions on the permeability of the different w/o and o/w PE, a deeper understanding of phenomena occurring near the membrane will be gained by direct observation of the deposit layer. 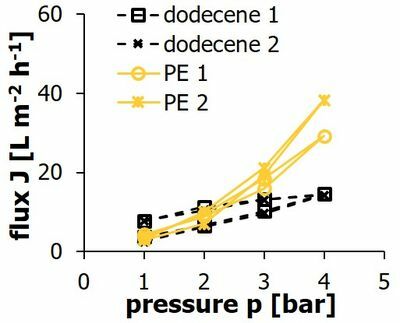 This will be required for mechanistic modelling and to explain the observed increase in permeability (see Fig.). In addition, B6 will develop a micellar enhanced ultrafiltration (MEUF) step for the recycle of surfactants and catalyst from the decanted water phase in MLS which will later be integrated into the miniplant (with D2).